Agboloshie has been apprehended for allegedly setting her husband and brother in law ablaze. A woman identified as Comfort. 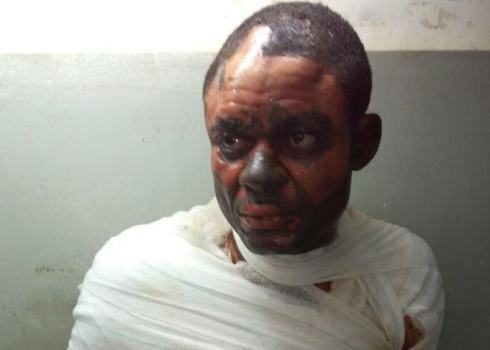 According to Ghanaweb report, Lawrence Nkem, the victim and husband of the suspect, and his brother Benjamin Oyem was burnt severely when she set fire to some clothing items soaked in kerosene and threw them into the room where they were sleeping and locked the door. However, the suspect’s husband who survived the tragic nightmare is currently in coma at the Korle Bu Teaching Hospital, while the victim’s brother died in the course of the burns. After a police investigation was carried, the Public Relations Officer of the Tema Regional Police Command, Assistant Superintendent of Police (ASP) Ms Juliana Obeng, confirmed that the incident occurred in a house at Ashaiman Lebanon Zone Two on Thursday, November 17, 2016. She said before the suspect carried out the act, she allegedly took her three children, all females, aged four, seven and nine, from the room in which they were sleeping with their father and uncle before setting them ablaze. Speaking on rescuing the man and his brother, she said neighbors who saw the fire managed to rescue the two brothers who had sustained severe degrees of burns and quickly rushed them to the Tema General Hospital. Meanwhile, it’s yet to be revealed what must have led to the woman’s harsh decision kill his husband and brother in-law at their home.